A Chinese go to gets a sticky Japanese make over, with this delicious delight. Remove the piece of pork from the gastronome and cooling rack, place into an oven tray with high sides. Drizzle oil over the top of the pork along with salt and start at a high temp to get crispy crackling. Stir KNORR Concentrated Liquid Stock, KNORR Chinese Honey Soy Sauce GF, KNORR Professional Ginger Puree and the rind and juice of one orange. Once combined - pour into the oven tray - DO NOT - get any moisture on the top of the pork. This will prevent a nice crackle. Braise in the oven for 2/2.5hours. Whilst the pork is cooking - combine flour, baking powder and 15g sea salt in a large bowl, make a well in the centre, add eggs and gradually add 500ml cold water, stirring until smooth and combined. 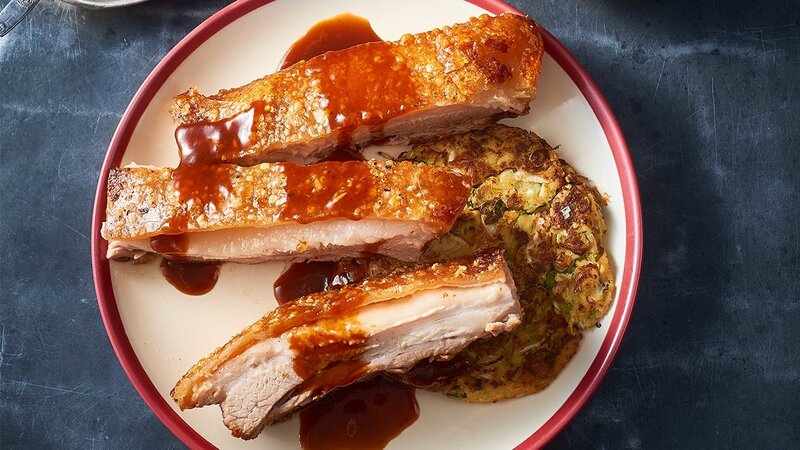 Stir in cabbage, onion, potato and KNORR Professional Ginger Puree and set aside to rest for 30 minutes. Heat a little oil in a non-stick fry pan and cook the okonomiyaki mix in batches until you have ten pancakes.